Sound Travels was conceived by Georgie Pope, harpist, ethnomusicologist, and Managing Editor of the official paper of the Glastonbury Festival of Performing Arts, The Glastonbury Free Press. She holds a first class BA in English Literature and Art History from the University of Leeds, an MA with Distinction in anthropology with the School of Oriental and African Studies, University of London and is currently undertaking an AHRC sponsored PhD in ethnomusicology at King’s College, London. She speaks French, conversational Hindi, a smattering of Spanish and Bengali as well as English which is her mother tongue. A classically-trained harpist, she’s a regular jammer and performer. Over the last four years she’s explored villages across India which has led her to meet and work with some extremely inspiring people. Hover your cursor over the image below to read about some of them. Sound Travels could not exist without its strong network of musicians, travel agents, musicologists, event organisers and arts organisations. Sound Travels is glad to have Gopal Singh Chouhan – music-lover, researcher, event organiser and cultural activist from the Northern Rajasthani city of Bikaner – managing our Rajasthan tours, and acting as adviser, interpreter and guide. Through cultural heritage NGO Lokayan and his newsletter Yuvayan, Gopal campaigns for the restoration and preservation of Bikaner’s beautiful carved havelis, amongst other cultural ventures. He works closely with Shabnam Virmani in The Kabir Project and has organised a number of related events and projects, including The Kabir Yatra – a beautifully envisaged roving village festival, celebrating the spirit of mystic poem and song. Quo Vadis, our principal travel partner, specialises in bespoke travel to Bhutan, India, The Maldives, Nepal and Sri Lanka. They are principled and reliable tour operators, which is why Sound Travels has chosen to work with them for our fixed departure trips! A festival which brings together more than 250 Musicians and performing artists from across Rajasthan and around the world to celebrate their musical heritage and create new sounds through innovative collaborations. Hosted at the magnificent Mehrangarh Fort, Jodhpur, for five days every October. Our Rajasthan-based activities are organised in conjunction with the Jaipur Virasat Foundation, a charitable trust which works with and for traditional artists in Rajasthan. It has pioneered a holistic, culture-based and cross-sector approach to livelihood generation through its various activities, events, advocacy forums and networks, always employing best practices. A specialist travel company comprising a network of travellers, travel professionals, writers, photographers and tour operators, coordinated by Nathan from Escapology Travels Pvt. Ltd. If textiles, craft techniques, cookery or photography are more your thing, you should try the Wonderful Workshops programme in Jaipur. Based on traditional craft techniques of the magical city of Jaipur, the workshops are led by local master-craftsmen in collaboration with well-known British artists and designers. 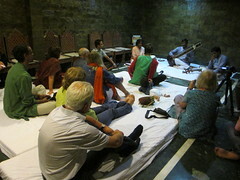 They’re very hands-on, you learn a lot, meet a great bunch of people and there are fantastic musical evenings in Diggi Palace. They run every January before the Jaipur Literature FestivalTand we always run a Sound Travels tour of Rajasthan before or after the Workshop. Another friend of Sound Travels is the writer, historian and Delhi aficionado Sam Miller, who wrote the hilarious and insightful Delhi: Adventures in a Mega City. 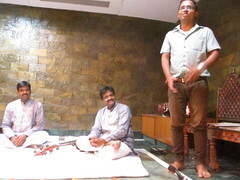 He takes Sound Travels guests on historical walks in the city. Pete Lockett is an astoundingly talented multi-percussionist. He can play every drum you can name, and far more besides. 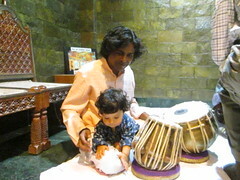 In 2010, he undertook a wonderful collaborative project with twenty-four Rajasthani musicians – some highly skilled Manganiyars and some non-professionals that have developed unique drum and dance performances. Georgie Pope lived in Jaipur for two years, working with the Jaipur Virasat Foundation, which included coordinating collaborative projects involving local and international artists (Mumford and Sons, Laura Marling, Susheela Raman, Pete Lockett, Sona Mohapatra…) She now lives in New Delhi.